Forget what you think you know about Mexican food. Forget margaritas, fajitas, guacamole and tequila. Let me tell you a tale of Mexico that has little (okay, nothing) to do with what you order at Chipotle or Taco Bell. Instead let me open your eyes to pork, cheese, chocolate, and chilies (and perhaps a grasshopper, or two). This is the tale of Puebla – Mexico's original foodie destination. Puebla, the fourth largest city in Mexico and 75 miles outside of Mexico City, is a colonial town that is well known by the avid traveler to Mexico. Puebla is all about teasing your senses. It bursts with brilliant colors. Walls boast broad graffiti murals, while homes are painted the spectrum from Easter egg pastels to slow-burning oranges. The streets hum with a buzz of activity. And clouds of smoke waft from roadside stalls turning out slow-grilled meats. 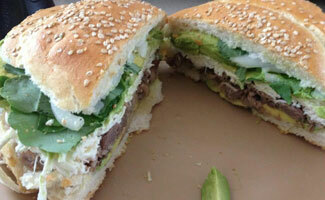 If history and architecture are not enough to draw you to Puebla, then go solely for the food. Trust me, it will be enough. 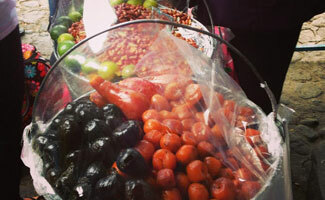 Outdoor markets offer everything from candied peaches to peanuts and grasshoppers sautéed with chilies and garlic. Poblanos, or citizens of Puebla, are heralded throughout Mexico, and the U.S., as some of the best cooks around. Are you a fan of mole (that heavenly saucy mixture of chocolates and chilies)? Yeah, that's a Puebla brainchild. One of the best spots to sample Puebla's local flavors is at the Mercado de Sabores Poblanos, a U-shaped food court where more than 130 vendors set up shop. The indoor market is packed to the gills with Poblanos who are piling their tables high with regional delicacies. Diners can sop up tacos árabes (pork wrapped in a pita), meats doused in mole, camotes (sweet potato candies), and cemitas (fat sandwiches stuffed with a choice of meats, Oaxacan cheese, and avocado). Don't forget to wash it all down with a frosty Sol or Modelo Especial beer. The best part? Food items typically run from just 35 to 50 pesos (approximately $3–$4). Mercado de Sabores Poblanos can be found on 4 Poniente between 11 and 13 Norte. Still hungry? Visit Puebla's El Mercado de la Acocota, near the center of colonial Puebla. Visitors are greeted with hanging meats, from cured chorizo to whole chickens and pig heads. Vegetables and fruits pack a punch of color to the industrial indoor market. Spices and chilies create a dizzying aroma. It's sensory overload in the best way. You'll find the market at Avenida 6 Oriente (Entre la 16 Norte y 18 Norte). In addition to mole, tacos árabes are one of Puebla's most notable dishes. For the best in the city, it is worth the wait at Las Ranas. These pitas stuffed with dripping, marinated pork are remnants of the city's Lebanese community. A taco will run about 14 pesos, which is just about $1. How can you say no to that? Las Ranas is on Avenida 2 Poniente 102. If you're feeling adventurous, it is worth a trip to Atlixco, a nearby town that sits at the base of the looming (and often still smoking) Popocatépetl volcano. Here, the Mercado de Atlixco, on Avenida Independencia, is a smorgasbord of authentic delicacies, such as barbacoa (dried, salted beef), local cheeses, and grilled meats. Enjoy this market on Av. Independencia (5 Pte.) in Atlixco. In addition to the street markets, Puebla is home to a wide array of restaurants. While it's always fun to enjoy a bisteca quesadilla on a shaded bench, sometimes it is just as fun to order off a menu. Fonda La Mexicana is one of the best restaurants to try mole poblano at, and it's a spot vetted by locals. Visit the restaurant at Avenida 16 de Septiembre 706. Dining at courtyard restaurant Meson Sacristia is like eating inside a Mexican antique store. The restaurant, which is part of a boutique hotel, is Mexico's version of hipster-chic, with pottery, antique books, statues, dishes, and musical instruments. Menu items range from street foods like chalupas and zucchini-blossom quesadillas, to more elaborate fare like the Santa Rosa enchiladas and manchamantel (pork served with chili, plantains, and sweet potatoes). The hotel sits at 6 Sur (Callejón de los Sapos) 304.